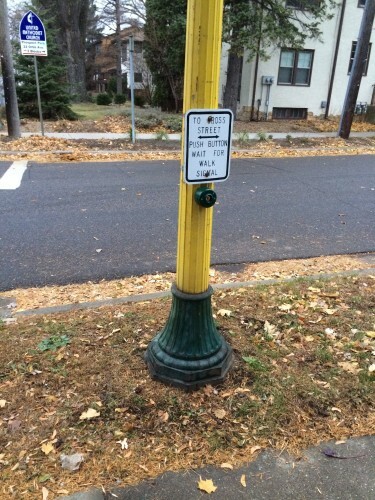 Cross-posted from streets.mn: Begging for Simplicity … in which I complain about beg buttons, and general second class treatment for pedestrians. Pedestrian actuators call for a pedestrian signal at an intersection which is semi-actuated (where the green-time goes to the mainline except when a vehicle is on the side street, subject to a maximum cycle length and a minimum green time for the side street) or fully-actuated (where the green time is allocated to approaches which are actuated subject to a lot of constraints). When they do this, they also tell the controller to extend the green time (and parallel walk signal) given to a phase to be sufficiently long to allow pedestrians to safely cross. But this has problems. Imagine you are on a side street about to cross a main street and the light turns green for the cars, but the Don’t Walk sign remains (since no Pedestrian actuation was recorded). You did not get to the actuator quickly enough. Should you cross on the Green but against the Don’t Walk, or should you wait almost an entire cycle for this to come around. You may or may not have enough time to make it across. Second, imagine the actuator is broken. It may never give a walk signal. (There aresolutions for that, where the default state of broken is “on” instead of “off”, but that doesn’t seem to be widely deployed). For instance, recently I reported toSeeClickFix a broken pedestrian actuator at Franklin and Seymour Avenue in Southeast Minneapolis, which was corrected within 18 days (i.e. the case was closed within 18 days). I am fairly confident a broken traffic light serving cars would have been corrected sooner. 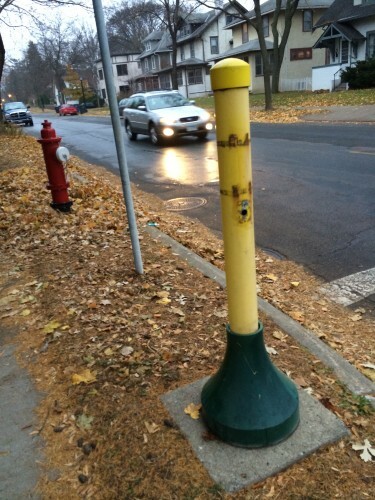 The next two “beg buttons” (pedestrian actuators for traffic signals) were recently photographed. 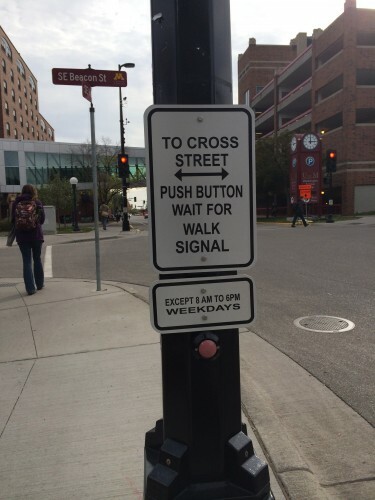 The one on the University of Minnesota campus (at Beacon and Harvard) recently had a time exemption added, implying that the actuator need not be pressed between 8 am and 6 pm weekdays. (This time exemption seems to have been removed since the photo was taken). This is an improvement over the previous situation (pushing the button in the middle of the day). Still one expects this will, like so many others, become a placebo button, or just break and make it so there is no pedestrian phase. However, the complexity is still needless. Traffic signals on streets with sidewalks (which implies pedestrian traffic either exists or is desired) should ALWAYS have an automatic walk phase, just as every cycle gives green time to cars from every approach. (This is especially true in pedestrian areas like a college campus which has a plan that aims to prioritize walking.) 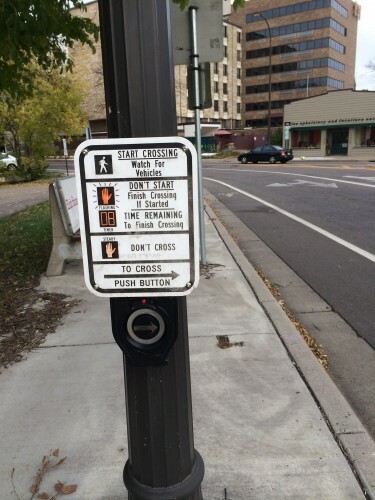 Actuators are fine if they make the walk signal come sooner, but being unpushed should not be used as an excuse not to have a walk phase at all. Car drivers don’t have to go out of their way to press actuators, why should pedestrians? Fortunately it is not as complex as the last, at Minneapolis’s favorite five-way intersection (Franklin Avenue, East River Road and 27th Ave SE), which gives instructions for something that should be tacit. That it is not tacit indicates it is a flawed design. If I can read the instructions, I already know how to cross a street. It is not like pedestrian actuators are a new technology. While I want more information at bus stops, crossing a street should be straight-forward, and not require an 11 line instruction set with five graphics. Sadly there is more information here than at the nearest bus stop. Update. I found the tweet below, which seems appropriate.